Just to let you know that the shovel was delivered on Thursday.First chance I've had to e-mail you. We're very impressed with the shovel and I'm sure it will be a big help to us.It was left with a neighbour and a card put through the door.No problem.Thanks again for all the trouble you went to getting it to us. I just had to congratulate you on your excellent service. Having ordered the shovel on 18th Dec (Saturday) at around 5.30 pm, I never expected it to arrive before xmas. To my surprise it arrived on Wednesday 22nd. Having now purchased a snow shovel we will probably be snow-free for the rest of the winter but at least I am now prepared when more snow arrives. Thank you and a happy New Year to all your staff! I was not let down like Amazon and ebay, delivery very fast thank you. Item turn up prior to xmas which is a bonus as I can now let the wife have it as a present, she will enjoy that!!!! ‘Just had to write and thank you very much for your quick response to my Order Number: PO 1508 Alpin 2 Alutube Snow Shovel! It was delivered to us at around 11 am this morning! That was really great, considering some of the awful road conditions your men are having to contend with! YOU AND YOUR DRIVERS ARE DOING A WONDERFUL JOB AND ARE CERTAINLY TO BE CONGRATULATED!!! You certainly outdid “Tesco’s” and “Home Base”, both of whom I tried to order with. Have a really good Christmas and I hope you all stay safe. Yes thank you, I received my snow shovel yesterday, super fast service and wonderful quality snow shovel. I've recommended you to my neighbours and may buy another from you soon. Great to buy from such a professional company and wish more businesses were like yours. Many thanks for the superb snow shovel and a speedy delivery service. Would you please send details of your wholesale prices for the sledges and snow shovels. I have a hardware store and I am currently looking for suppliers for winter stock..I am aware of the situation of stock levels but i would like to look for the winter 2011 in advance. Many thanks for the prompt delivery - our two snow shovels arrived this morning. From the weather forecast it looks like they are going to be put to good use pretty soon! Just a quick thanks for your prompt delivery and service. 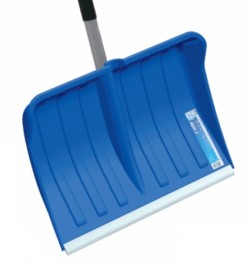 The snow shovel arrived just as the snow fell in our area and was tested "out of the box"! I was able to clear both my and my elderly neighbours drives quickly, looks like the shovel will be very useful over the next few weeks and go on for years!